Prostate Cancer: Hormonal therapy did not work. Don’t be fooled by a drop in PSA! James (not real name) is a 58-year-old Indonesian. His problem started in early 2016 when he lost his appetite, felt fatigue and lost weight. Blood test showed his PSA was more than 500 and his alkaline phosphatase was 200 plus. James went to Singapore to consult an urologist at a private hospital. A bone scan showed his prostate cancer had spread to his bones. James was given Lucrin injection (three months once) and an oral drug, Casodex. Three months later, the doctor increased the Casodex dosage because his PSA was rising. With the treatment, James PSA dropped to 0.03, his alkaline phosphatase was at 270 (table below). Eight months later, (December 2016) his PSA started to increase again from 1.6 to 6.0 and by June 2017 it was at 89.4. The treatment failed (Table 1). Disappointed with the results, James consulted another doctor in The Singapore General Hospital. A PET scan results showed evidence that the cancer had spread to his bones. James continued to receive his Lucrin injection but Casodex was discontinued. He was asked to take a new oral drug Enzalutamide (or Xtandi). This cost SGD 5,600 per month. James was also told that if the above treatment is not effective, then there is no other option but to go for chemotherapy. James found us in the internet and decided to seek our help. During his first visit we prescribed herbs for his problems. Three months later, September 2017, James came back to see us again. James told us that after seeing us, he went back to his doctor in Singapore and was started on the new oral drug Xtandi. He took 4 tablets of Xtandi per day for the three months while at the same time half-heartedly following our therapy. When James showed me the two blood test results done in Singapore, my immediate remark was, Good – what else do you expect? Cannot ask for more! His PSA in June was 89.4 and with Xtandi and herbs the PSA dropped to 19.8. Great result! But hang on, James had not finished his explanation yet. Actually I am being fooled by these numbers. James said, he monitored this PSA level often (Table 3). And if you study the numbers below properly you will note that James is heading for another disaster. That SGD 5,600/month drug and our herbs did not work! After James took Xtandi (+herbs) for about 2 weeks, the result was dramatic fall of PSA from 101 to 55.5. That’s a 50% reduction. You cannot ask for more. Then for another 2 weeks, the PSA dropped further to 8.5. Fantastic results — PSA dropped from 101 to 8.5 after one month on Xtandi. Hang on! Barely a month later, the PSA on 30 August showed the PSA had gone up to 14.9 from 8.85. That the beginning of disaster. Within a month, between 2 August and 6 September the PSA had doubled from 8.85 to 16.6. This is a clear sign of failure. Besides the PSA what could be another possible problem is James’ liver function is deteriorating as shown by the increase in AST and GGT. James has to watch out for this too. Xtandi is a drug used to treat hormone-resistant prostate cancer that has metastasized, or spread to other areas of the body. Xtandi costs $7,450 per month. The average treatment course is eight months, so the cost of Xtandi is usually about $60,000 for a full course of treatment. Xtandi (enzalutamide) is an expensive prostate cancer drug market by Astellas Pharma, a Japanese pharmaceutical company. The total cost for a one-month supply of Xtandi (120 pills) comes to $8,839.49, or around $73.66 per pill, $294.64 per day, and $107,617.26 per year. The drug costs much more in America than it does elsewhere, with a U.S. list price of about $129,000 per treatment course, compared with $39,000 in Sweden and in Astellas’ native Japan. In Singapore, James paid SGD 5,600 for a month supply. Xtandi is an oral medication that inhibits the androgen receptor, which drives prostate cancer progression. In a phase III clinical study of patients previously treated with chemotherapy, Xtandi reduced the risk of death by 37 percent and increased median survival by 4.8 months, compared to instances where subjects took a placebo. In a separate phase III clinical study of patients not previously treated with chemotherapy, Xtandi reduced the risk of death by 23 percent and increased median survival by 4 months. Can Xtandi cure prostate cancer? Try google this question and see what you get. There is NO mention of cure, only delayed deterioration. In the case of James he is still fine and he is not dying yet. HIs main concern is his PSA is rising in spite of all the drugs taken. From our conversation with James and his wife, it appeared that we are wasting our time. I told James and his wife our herbs are not magic bullets and I do not expect his PSA will drop like when he was medical drugs. Healing needs full commitment. James did not show that he has that commitment. He did not take care of his diet. Once a while he ate things that he is not supposed to eat. Did he really take his herbs properly? I am not sure either and I did not ask him about this. In fact I told James and his wife. If I was told earlier that he wanted to take Xtandi, I would not have prescribed him the herbs. It would be better that he takes the Xtandi first and see what happened. If and when the doctor’s drugs cannot work anymore then he can come and see us for help. Although James said he benefited from taking our herbs, I am not sure if this is true or not. BY DOCUMENTING THESE STORIES IT IS OUR HOPE THAT YOU OR YOUR LOVED ONES CAN LEARN SOMETHING MORE THAN JUST “GOING TO THE DOCTOR OR HEALER” TO SEEK TREATMENT. Case 1: FYC is a 67-year-old man. In 2012, his PSA was at 19.0. A biopsy confirmed prostate cancer with a Gleason score of 4+5. FYC was given two options. One, go for surgery or two, undergo hormonal therapy. FYC opted for the latter. He was given Zoladex injection at 3 monthly interval. In addition took oral Casodex. His PSA dropped to below zero. All was well. However, 2 years later, his PSA started to increase again. FYC underwent 6 cycles of chemotherapy using Taxotere. He did not suffer any side effects. A bone scan in February 2014, showed bony metastasis. The cancer had spread to his 2nd rib, thoracic and lumbar vertebrae, sacrum, right sacroiliac joint, both ischii and lesser trochanter. FYC received 10 sessions of radiotherapy. His backaches were resolved after the treatment. FYC was alright for about 8 months. In November 2014, FYC had severe back pain again. Bone scan showed extensive metastases. FYC had 5 cycles (scheduled for 6 cycles) of chemotherapy using carboplatin + cabazitaxel. One cycle of this chemo cost RM 15,000. His PSA readings from November 2014 to February 2015, were as below. FYC had no other option and came to see our help. Case 2: Tom (not real name) is 76 years old. About 7 years ago he had blood in his urine. His PSA in July 2007 was 15.7. By December 2007 this had risen to 33. He consulted a urologist on 17 January 2008 and underwent a prostate biopsy. MRI and bone scan proved normal but biopsy confirmed a Gleason score 3+4 cancer. Tom proceeded to have an open radical prostatectomy with bilateral pelvic nodes dissection on 25 January 2008. Histology unfortunately confirmed extensive cancer and there were a couple of positive nodes bilaterally. The margin was positive. Tom was immediately started on Lucrin and proceeded with radiotherapy from 24 March to 15 May 2008. His PSA dropped to 0.01 — 0.03. He was on Lucrin for 2 years after his radiation. His PSA crept up to 1.4 one year after his Lucrin was stopped. On this basis, he went back on Lucrin again. His PSA responded by falling to 0.1 in February 2011 but by November 2011 it has risen to 0.3 and 0.5 by May 2012 and rose to 2.0 by August 2012. At this point, Tom was started on Casodex. Test showed that Tom was predisposed to osteoporosis. So the doctor started him on Fosamax. Tom was on Casodex for about 4 years. Then his PSA started to increase to 14 plus. The urologist advised orchidectomy (removal of the testes). His PSA did not decrease at all even after the surgery. Instead, it went up to 22 then 35. A CT scan in July 2014 indicated sclerosis of the T6, T 10, L4, L5, sacrum and coccyx. Compression of L3 vertebral body was noted. There were multiple nodules in both lungs, indicating metastases. Tom consulted a few oncologists and decided to go for chemotherapy. Tom completed 6 cycles of chemo with Taxotere (docetaxel) in December 2014. His PSA then was 15. While on chemotherapy, TH suffered the side effects such as: total loss of hair, loss of appetite, lack of strength, etc. Since he had pain in his lower back bone, 10 sessions of radiation were given to him in February 2015. His PSA shot up to 264 in February 2015 while he was undergoing radiotherapy. A month later, March 2015, his PSA increased to 531. The oncologist suggested that Tom go for another round of chemo either with Jevtana or oral drug Zytiga (abiraterone acetate). Zytiga cost RM 12,000 per month. Tom did not think that he was fit enough to take another hit from chemo drug. His overall health condition and energy level had deteriorated rapidly since January 2015. He lost 6 kg in one month. He has no appetite, he has numbness in his feet, weakness in his legs, wet cough that seems to worsen over the week, and he constantly has hyponatremia (low sodium in blood). Tom’s daughter wrote: We also learned that he has drug-induced diabetes after chemo. We hope that our father will receive an effective alternative treatment from you after reading the information from your website. His PSA reading from July 2014 to March 2015 showed a rather drastic increase. Tom, his wife and daughter came to seek our help. Chris: Did you ask if all the treatments they gave you were going to cure you? They answered: No, the doctor said no guarantee! C: Who ask you to come and see us? Tom: My doctor. I went to his clinic and he told me right away that I should seek your help. C: Is he a medical doctor? Two prostate cancer patients from two different places, treated almost the same way by different doctors in different hospitals, achieved almost the same FAILED results. JEVTANA may fight tumors that have become resistant to docetaxel, so it may help you even if docetaxel is no longer working. JEVTANA can also cause severe allergic reactions. Severe allergic reactions can happen within a few minutes after your infusion of JEVTANA starts, especially during the first and second infusions. Symptoms of severe allergic reactions may include rash or itching, skin redness, feeling dizzy or faint, breathing problems, chest or throat tightness, swelling of face. JEVTANA can cause severe stomach and intestine problems, which may lead to death. Vomiting and diarrhea can happen when you take JEVTANA. Death has happened from having severe diarrhea and losing too much body fluid or body salts with JEVTANA. JEVTANA can cause a leak in the stomach or intestine, intestinal blockage, infection, and bleeding in the stomach or intestine. This can lead to death. Kidney failure may happen with JEVTANA, because of severe infection, loss of too much body fluid (dehydration), and other reasons, which may lead to death. Read carefully and prayerfully. Decide for yourself what is good for you. Your life is in your hands. 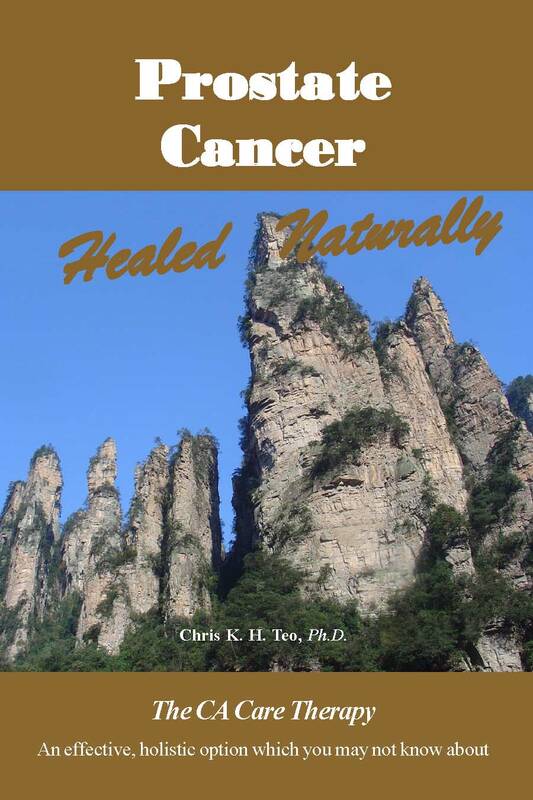 To know more about healing of prostate cancer, read this book.